Researchers have long touted the health benefits of omega-3 rich fish, and now research suggests it could substantially reduce your RA risk. MONDAY, August 12, 2013 – Eating four servings of low-fat fish weekly may cut your risk of developing rheumatoid arthritis in half, according to a study published today in the Annals of the Rheumatic Diseases. Rheumatoid arthritis (RA) affects about 1.3 million Americans, causing progressive, often debilitating swelling of the joints, chronic pain and fatigue. Adding large quantities of fish to an already healthy diet could prevent people from developing the disease, Swedish researchers found. The study looked at more than 32,000 women with a median age of 72 who answered an initial mail-in questionnaire between 1987 and 1990 and a follow-up questionnaire about a decade later. The surveys asked respondents to detail their eating habits and incorporated questions about the types of fish they most often ate. 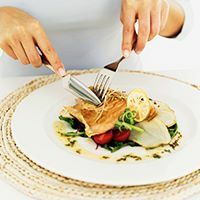 Of the 32,000, only 205 women said they were newly diagnosed with rheumatoid arthritis during the follow-up survey, which researchers credit to a diet high in fish. Those who ate about one or more servings of lean fish every week for the decade reduced their risk of developing RA by 29 percent and eating four servings weekly reduced their risk by 52 percent, according to the study. Scientists and nutritionists have long touted the health benefits of omega-3 rich foods like fish, nuts, and flax. A 2009 study published in the journal Epidemiology, comes to similar conclusions, saying “intake of oily fish was associated with a modestly decreased risk of developing rheumatoid arthritis.” However, most researchers balk at setting strict guidelines for nutrient consumption. There are so many different body types that it’s difficult to pinpoint nutritional rules, said Helene Belisle, the executive director of the Arthritis Research Foundation. The study was “observational,” which means it didn’t assign different courses of treatment to groups of randomly selected individuals, but instead simply observed what happened to women who reported eating different quantities of fish. As a result, it doesn’t permit scientists to conclude that higher fish consumption actually leads to lower RA rates. It’s also unclear how accurate participants could be when asked to remember what they had for dinner a year ago. Another expert said it would be tough to get Americans to adopt the kind of diet suggested by the study. “Compliance in [the medical] field is notoriously difficult,” said Michael Ormsbee, PhD, assistant professor in the Florida State University in the Department of Nutrition Food and Exercise Sciences. “With something like that, [people] need to start small and work up to it. The habit shouldn’t feel like a challenge,” he said. Health Risks Outweigh the Benefits? The potential benefits of avoiding RA would also have to be balanced against the risks of eating fish contaminated with toxins such as mercury, which can cause birth defects, as well as impaired speech and coordination. “There’s always that question, if you’re eating fish that’s contaminated with other products then there’s a risk of developing problems,” Dr. Cooper said. However, people would have to eat a lot of fish to get the kind of exposure that could cause significant health issues, he added. Still concerned about toxins? Buy molecularly distilled fish oil capsules and take at least 2,000 milligrams a day, Cooper said. The supplements are not as rich in omega-3s as actual fish, but they’re a good alternative for those who are nervous about contaminates, and people who don’t like eating fish. “People develop eating habits early in life, and you’re not going to change that so just take the equivalent in capsules,” he said. “Even a moderate consumption of fish is sufficient to reduce risk of disease,” today’s study said, however, make sure you don’t rely on fish and neglect diet and exercise. Staying healthy requires a balanced diet including fruits, vegetables, and some fats and carbohydrates.